A few weeks back, the Philippine government implemented a strict traffic law to ensure the security and safety of travelers. R.A. 10913 or the Anti-Distracted Driving Act allows road travelers to be on the safe side. Most commonly referred to as “No Texting While Driving,” the law is pretty straightforward. Although you might think this prohibits the overall use of gadgets, there actually are exceptions. Moreover, the Department of Transport (DOTr) released revised rules and regulations of this act. To give you some sort of a refresher, this law applies to all vehicles that hit the road. Yes, even government cars, private cars, jeepneys – everything that you can see in motion in the streets. 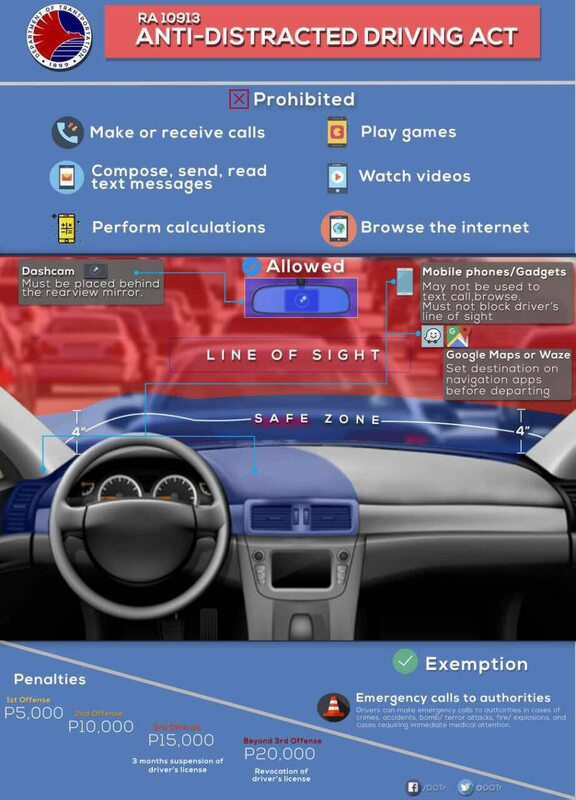 What actions are considered to be against the Anti-Distracted Driving Act? This law applies to all vehicles whether in motion or during a full stop; a red light or heavy traffic. So if you think that it is an exemption if you are stable, well it’s not. Someone who is using other electronic gadgets with display monitors such as dash cams, media players, and other similar devices is also included. Placing an electronic device against the line-of-sight of the driver, which includes hanging any gadget in front of the driver or anything that would cover view of the windshield is also prohibited. NOTE: This law also applies even if drivers are on a FULL STOP. You might be wondering about the line-of-sight and how it is measured. To give you an idea, look at the image below that explains this. As you can see, the line-of-sight is the RED zone. About four (4) inches above the steering wheel. Anywhere before that red zone is considered the SAFE zone which is color-coded in BLUE. Now, you might be wondering what the SAFE ZONE is and that’s what we are about to discuss. So there is a Safe Zone despite the law. What are the things drivers can do to avoid unintentionally disobeying the law? 1. If a driver is in dire need to use mobile devices and/or other gadgets, the driver needs to stop somewhere on the shoulder of the road away from normal traffic. Alternatively, they can utilize their car-speaker to allow to hear the activity on the mobile. 3. To be on the safest side, drivers must remove all mobile devices and gadgets in the line-of-sight zone and let it sit on the SAFE ZONE. NOTE: Even if you can utilize the hands-free function of your device, it still needs to be out of your line-of-sight. Basically, the safe zone is an area where you can let mobile devices sit comfortably. Manually handling it, even under the SAFE ZONE, is still not an exception to the rule. Are there any exemptions to this act? As we’ve told you, there are exemptions to this law which you need to know. Other emergency services, agency or entity. NOTE: Even if these are exemptions, to be on the safe side, pull up on the side of the road before you make any activity with your mobile device or gadgets. Because you might be safe from the law but not from the dangers of distracted driving. Dashcams are allowed as long as they are placed BEHIND the rearview mirror. The department allows the usage of navigation applications. However, they need to be properly set-up before driving and they need to be in hands-free state. Just a small piece of advice, even if there’s no law bound to this, it’s quite common sense that you are not obliged to use mobile phones while driving. Why? Because even if you do not get caught, you’re risking your life for it. Well it’s always better to be in the safe side, right?